This was a fun piece. I hope you enjoyed it. Stay tuned as I will be posting a new lesson soon! If you would like to work along with a lesson that was posted in the past please email me. Let me know which lesson, then you can order the reference materials via my etsy shop. To purchase prints you can visit one of the many galleries in Michigan, Ohio and Florida that carry my work, see my website for details. 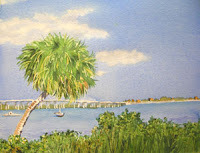 To take a class locally visit: http://watercolorworksart.com/Classes.